Today is Reformation Day and, as a nod to the day and the history behind it, I have another new release from Concordia Publishing House to offer to one of you! 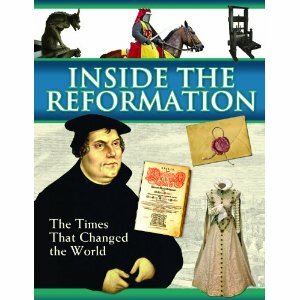 Inside The Reformation : The Times That Change the World provides a pictorial history of the events and times surrounding Martin Luther's action of nailing his Ninety-five Theses on the church door at Wittenburg. This book is not designed for any particular age group in mind. My children are just as curious to poke through it as I am. There is artwork to look at, pictures of weaponry displayed which was used at the time, as well as pictures of relics of the Roman Catholic Church (which I find fascinating to look at). If you cannot travel over to Europe and see these things for yourself (and I can't just at the moment) this is a nice collection of little snippets which further enlighten both the old and young as to what things were like "back in the day." It's a very handy resource and one that I am happy to have on our bookshelves for when we study either medieval life or the Reformation. Good news! Concordia Publishing House has offered a copy to one of my readers here at Reading to Know. Would you care to win a copy? Simply leave a comment below. Be very sure to leave a valid e-mail address so that I can contact you should your name be selected as the winner. This contest will be open through Tuesday, November 6th and is open to U.S. Residents only. THIS CONTEST IS NOW CLOSED. THE WINNER (as selected by Random.org) IS #18 - Jes! Congrats! Kudos to Concordia Publishing House for producing an appealing and useful resource for parents and teachers to use with their children and students. Many thanks to them also for sending a copy my direction in exchange for my honest opinion. Lastly - thank you for offering an additional copy to one of my readers! Thank you for your giveaway! I would love to share this book with my grandsons. This would be great for us right now--we are homeschoolers studying the reformation currently! We do need to teach the kids about Ref. Day...and this is a great way to do it. Great books that you shared all week, and this one looks great too! Thanks for the giveaway! Looks like a neat resource! I would love to share this book with my boys.